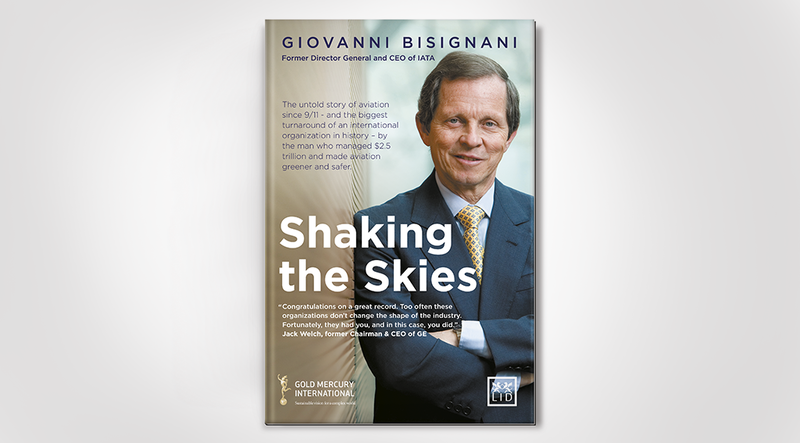 The book is authored by Giovanni Bisignani, former CEO of the International Air Transport Association (IATA). Shaking the Skies, is one of those rare books that changes the way you think about an industry. The book explains the most critical decade in aviation post 9-11, taking the reader through the most dramatic moments from the man who handled $2.5 trillion, made aviation safer and greener, and introduced with e-ticketing a new way of flying. During his time with IATA, Bisignani played a key role in reshaping the aviation industry and its governance. Whilst leading IATA, he set about modernising the industry and steered airlines through a crippling global crises. Jack Welch, Former Chairman & CEO of GE said about Shaking the Skies and the role of Bisignani delivering industry change: “Congratulations on a great record. Too often these organizations don’t change the shape of the industry. Fortunately, they had you, and in this case, you did”. 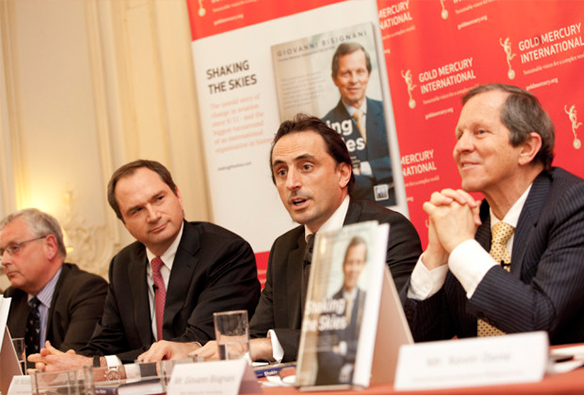 Photo Below: From left to right: Robert Milton, former Chairman and CEO of Air Canada, Nicolas De Santis, CEO, Corporate Vision and President, Gold Mercury International and Giovanni Bisignani, former CEO of IATA at the book launch at the Royal Aeronautical Society in London. Shaking the Skies: Book Reviews by Fortune 100 CEOs and global aviation leaders: Welch former CEO of GE, Mulally of Ford, Kelleher of Southwest among leaders praising the book and Mr Bisignani’s achievements. “Shaking the Skies reinforces the importance of ‘working together’” to deliver a compelling vision, employing a comprehensive strategy and using a relentless implementation process. Thank You Giovanni, for all you have done to bring people together around the world through safe and efficient transportation”. Mr. Bisignani’s achievements and changes did not seek to purely benefit IATA and its associated airlines; rather, he pursued a system of change that improved every aspect of the industry. His changes began with management restructuring and, to name one of many successes, led to him enforcing e-ticketing and subsequently making aviation the first ever industry to “enter the paperless world.